A new novel, hot out of the Dragon’s Mouth Press in Hong Kong (ISBN 988-97752-3-9). Two years ago, this author presented us with the book Pole Dancer, which was an insightful look at the oldest profession, played out around chrome poles in Thailand. As an ‘airport’ novel, it slotted in well, easy to read and put down again, and I even forgave it the somewhat far-fetched ending. So when Free Time arrived on my desk, I was interested to see what “R.D. 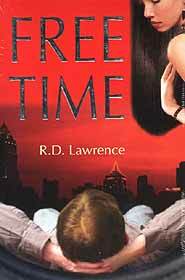 Lawrence” (pen name) had done in the intervening two years. His protagonist is Inspector Jack Straw, the policeman who helped put him away, only to see him fly the coop. Jack is sent on a mission to Thailand, and in Pattaya he hears that the elusive Billy is in the kingdom, using the alias Ronald Littles (as a humorous reflection on the other miscreant at large, Ronald Biggs). However, there are others, from the UK criminal society who are also looking for Billy Marshall. The ones who he cheated out of their cut of the action. The strong financial pull is enough to motivate those who make not working while having a high spending ratio, their stock in trade. The other major player is Niang, a bar girl, who has all the usual attributes: good looking, from Buriram, a dependant daughter and no steady job, living above a go-go bar in Soi Cowboy. All fairly standard fare. And oh yes, by page 136 you get to meet the family buffalo. The book, having introduced the characters, then begins to flesh out the minutiae to give some weight to it all. I actually found this a tad overdone, but perhaps I know Nana Plaza and Soi Cowboy too well, while first time readers and travelers to Bangkok do not. By half way through the book you have more than one double-cross going through, with everyone out to score off everyone else. Billy Marshall, being the major player, even to the point of using his pursuing inspector’s name as one of his aliases. That wry humor even runs through to the author using his previous book title as an anagram in a crossword puzzle! Another fine airport novel from R.D. Lawrence. Not too taxing to tire the brain and with enough characters to almost fill a local village telephone directory. The twists and turns in the plot unfold rapidly as the police attempt to nab Billy Marshall, and at the same time Billy attempts to trap the police. So who actually did win? You will have to buy the book to find out. And be prepared to invest several hours to reach the denouement. Jonathan Kelly was one of the greatest solo artists from the early Seventies. When I say solo artist I do not mean somebody that has a full backing band and orchestra, sings mostly other people’s songs, and the ones that are his own are mostly co-written. I mean somebody who can walk out on the stage armed only with an acoustic guitar and his voice, keeping an audience spellbound for two hours and then walks off to huge demands for encores. The main reason for Jonathan Kelly not being a household name is the simple fact that he followed the hippie dream, playing many free concerts, not really studying the words of the recording contracts too carefully, and taking people for their words, the biggest mistake you can make in rock ‘n’ roll. It is rock ‘n’ roll music too; it maybe just one man and a guitar, but it is certainly rambunctious music when Jonathan Kelly wants it to be, one guitar or not, as this live album amply shows. Jonathan Kelly’s recording career started in 1970 with the release of his self titled solo album, which, after a few false starts, had been made with some singles under his real name of John Ledingham, and one under the amusing synonym ‘Humpy Bong’. In 1975 Jonathan Kelly completed his recording contract with RCA. He then turned his back on the whole rock ‘n’ roll circus and literally disappeared. No big announcements, no final tours, he just picked up his new wife and family, cleaned up his act, and went to make a simple living in Wales, and that is the end of the story. Well almost. Certainly Jonathan Kelly’s previous albums and concert appearances in 1972 and 1973 had left quite an impression on many music lovers, particularly a gentleman by the name of Gerald Sables who made it his mission in life to go and find the man that had produced this magical music. Not only did he find him, but they became close friends. But Jonathan Kelly was still keen to remain anonymous, although in 2001 BGO Records bought the rights to Jonathan Kelly’s back catalogue and released ‘Twice Around The Houses’ and ‘Wait Till They Change The Backdrop’ on a two for one basis. I cannot recommend enough that you look this up on www.amazon.com and press ‘buy’. These albums are essential buys, and at two for the price of one, a steal. Then in 2004 BGO released ‘Waiting On You’ and ‘Two Days In Winter’ so that you can add to your Jonathan Kelly collection. Tragically Gerald Sable’s mother was diagnosed with cancer, but fortunately she fought the dreaded Big C and beat it. Gerald Sable wanted to do something to help the Fight the Cancer Fund, and because of his interest in music decided a concert would be a good way of raising money. To Gerald’s amazement his new friend Jonathan Kelly agreed to headline the concert. Word spread quickly and the tickets sold out instantly. By the end of the evening over one thousand four hundred pounds had been raised for charity - no mean feat in itself. So on the 20th April 2005 in a small club just outside Doncaster for the first time in thirty years Jonathan Kelly stepped onto the stage to perform to his public. The reception was deafening. There is no doubt that the man is a little nervous at the beginning of the set, but he need not have worried as the audience seemed to know the words better than he did. The whole recording brings joy to whoever is in ear shot and although he had been out of the public eye for more than thirty years the fans still loved him, even recognizing obscure B-sides like ‘Outside’, put out on the non album track ‘Waiting On You’. Jonathan Kelly’s voice may have mellowed a little over the years, but this actually suits some of the songs, allowing him to stretch every bit of emotion out of each song. Certainly his talent and popularity have not diminished in any way. In-between songs Jonathan Kelly entertains the audience with stories of the early seventies in his charming Irish brogue, which sets up the atmosphere of the concert perfectly. Some of the stories are hilarious. Sadly, at the moment this album is not available through the usual channels, but can easily be picked up by looking up Gerald Sables website for Jonathan Kelly at http://home.freeuk.net/jonathanled which is a wonderful site full of all the things you can possibly want to know about this artist. The website is now regularly updated, as after this concert Jonathan Kelly is dipping his toe into playing some more concerts, and who knows, we might even get a new album.